Three years ago my friends Maudie and Rich took an ultra-cheap trip to Hawaii to camp, run and soak up the tropical sights. As I dropped them off at the airport, they detailed their plans to me. The new couple aimed to tour around the island of Kauai, visit waterfalls and camp by the beach, or in their car—all on a super cheap budget. As someone who appreciates both thrift and travel, I loved it! And maybe was even a little jealous. 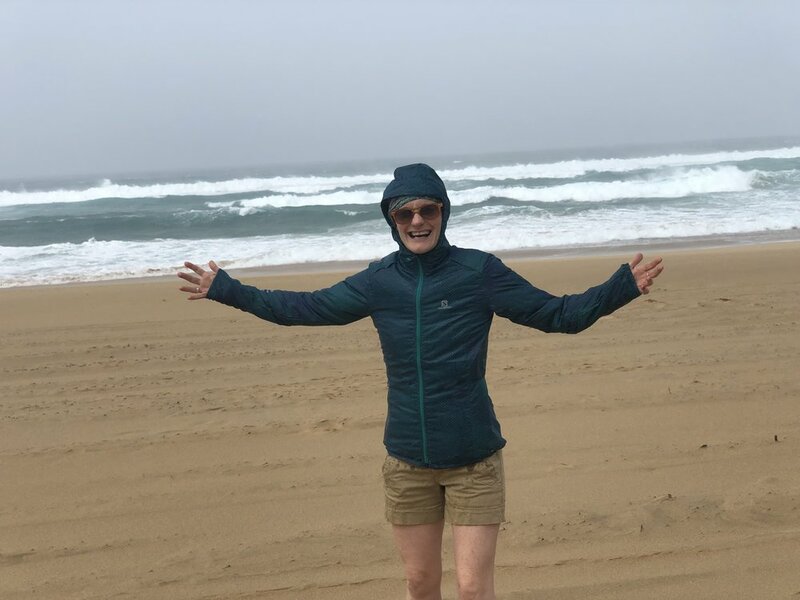 “We rented a ‘beater’ [low cost, older] car as we heard that some people will break into cars left at trailheads, and to cut down on costs,” shared Maudie. The photos they posted after their two-week trip inspired me: torrential rain storms, trails for miles and an adventure on a budget. I knew I had to do this and told them just that. Maudie responding with her normal enthusiasm. 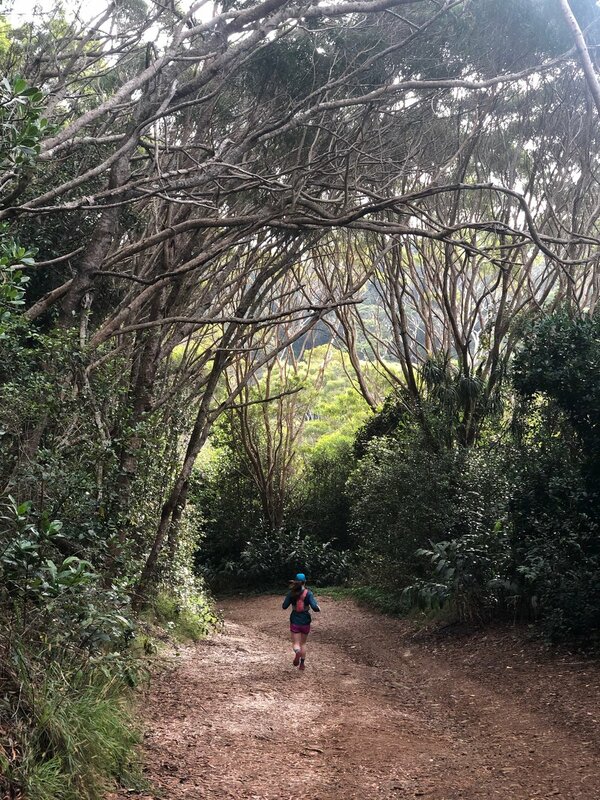 While trail races, visits to my family in NY and other obligations kept me from realizing this dream for several years, the idea of dirt-bagging in Hawaii never left my mind. There wasn’t a question on whether I would do this, just when. The face of FREE TICKETS! The perfect time finally came this past January. Emily had time off from work, and thanks to her flight benefits, we could get standby tickets on a direct flight from SeaTac to Lihue Airport on Kauai for a grand total of $0. After working a full day, I caught a Lyft directly from work and met Emily right after passing through security. We both carried identical Patagonia Black Hole duffles stuffed with sleeping bags, a tent, running gear and a few extra shirts and short. We each also carried a spare backpack that served as our “extra item” for the flight filled electronic readers, a drone and a few knick-knacks. To our delight, the plane never ended up selling full, so the two of us shared the full aisle and got comfortable as the plane went wheels up. I was particularly thrilled to see my dream be realized. The five and half hour flight was uneventful except that Emily caught a case of the jimmy legs—basically ants in the pants. “Why is everyone else except me being so cool right now?” she wondered out loud. It was night when we arrived at Lihue Airport. We headed over to the rentals area where we retrieved our rental car, a Dodge Grand Caravan with an essential feature: fold flat seats. You see, while we brought a tend and could easily camp out, our hopes were that we could just fold the seats and sleep in the back each night. All we needed to do was find a place to park, and BAM, camp was set. Fold flat seats are a must. Thank you Dodge for this beautiful technology. Thursday night we headed to Salt Pond Park. Emily had previously researched this location and while we didn’t have camping reservations, we figured we could slide into a parking spot and make ourselves inconspicuous. Luckily, that’s what happened …well, except for two significant exceptions. The first was that roosters roamed pretty much everywhere on the dark beach. Unlike the stereotype, they don’t just call at dawn, but actually crow ALL OF THE DAMN TIME. These feathered beasts especially crank it up to 11 when they notice anyone talking, walking, moving or sleeping in a van nearby. This is what happened to us. Walk outside to the toilets in the middle of the night and you’ll set off a series of dozens of vocally-gifted roosters. So much for keeping a low profile... UGH! The second incident occurred around 4 am when Emily unlocked the van’s door from the inside the vehicle without using the clicker. This briefly set off the van’s alarm until she was able to locate the correct button to silence it. Sorry people camping by. Sorry roosters for inspiring you to declare war on everyone. Emily and I woke on Friday morning ready to get away from the chickens and to fuel up with some caffeine. We headed into town and stopped at Little Fish Coffee in Hanapepe—a lovely spot. It took us less than an hour to circle the island on route to our first running adventure. The weather was not the balmy 90s I expected, but had a low that sunk into the 50s, and a morning not much warmer. Plus, rain was expected. Our plan was to run the Waimea Canyon. This would only be about five or six miles, but we were promised beautiful views and maybe even a waterfall. Luck was on our side. We ran down broad clay-covered trails and met the rim trail before the rain started. The sights across the valley were stunning: brown rock contrasted by lush green vegetation. Just as we crossed the waterfall feeder stream we saw two men standing at the edge of the cliff a few feet from where we had just approached. One wore a helmet. In an instant one of the men jumped off from the ledge—deploying his parachute from a fixed line tied to a tree. He landing a hundred or so feet below. The other guide/support member told us it was the first time anyone had successfully base jumped from that point. Besides the buddy, Emily and I were the only other witnesses to this moment in history. As we revered course and ran back up the trail, the sky opened up. The rain made the previously dry and hard ground turn into a muddy mess. Luckily, Emily and I were able to make our way out without taking a fall. The drive back down from the canyon ridge looked entirely different from what we had seen just a few hours earlier. Clouds had darkened the valley and muted all the colors. We were lucky to see the contrast in scenery. For lunch on Friday Emily picked up a Poke bowl from a local supermarket in Waimea, while I dined on a not-so-stellar hot dog from a local food truck. The lady at the supermarket checkout recommended visiting Polehale Beach—the same off-the-beaten-path beach recommended by the guy at the rental car place. While we were cautioned that we had to drive down a bumpy, dirt road for five miles to reach this scenic locale, we knew we had to visit. The weather in Waimea was breezy, but bright. Spying far up along the coast we could see Polehale. While the weather in the distance looked dark and ominous, our curiosity could not be abated. We drove North towards our destiny. Arriving at Polehale, we knew we were in for a treat. At least, the memorable, stormy type. The winds were ripping at over 30-50 miles-per-hour. There were multiple destroyed tents torn to pieces from the rain and sand tearing through the air. Emily and I ventured briefly to the waters edge to experience the full ferocity of the storm. We love being outdoors and doing intense stuff, but that was no joke. We lasted all of 30 seconds before retreating back away from the waterline and towards a park shelter. We shared beers with a few travelers and locals who were hunkered down there too. We shared stories of where we came from and remarking at the power of the wind. Friday evening we found a much quieter place to park the van, this at Lydgate Beach in Wailua. Like our first evening, we just located a space in a park and didn’t bother to try to camp. We didn’t give anyone trouble and we hoped no one would give us a hard time. Luckily, that was exactly the case. Maybe it was a combination of the season and weather, but the park seemed mostly vacant. We saw few tourists or visitors. Even better: the roosters were about 90% quieter and fewer in numbers. Saturday we woke and repeated our coffee routine we developed since… well, forever. We drove into Waialua to the very lovely Java Kai. After fueling up, we headed out for our next run: Okolehao Trail. We knew the five mile, out-and-back route traced the edge of a ridge that climbed up and down, and that it would include lots of technical trail covered in roots and vines. But how bad could five miles really be? The answer: There were ropes. And spiders. Emily led the first part of the trail until she had enough of “spider duty”. Done by the lead runner, this task included knocking down the dozens of webs (and their master architects) crossing the trail every hundred feet or so. After Emily bowed out, I took on the role and started eating web after web. Later in the hike we encountered four or five short and then progressively longer fixed ropes that helped us climb up the steep, muddy incline. Later when we reversed course the ropes helped us get down without taking a tumble. While this trail wasn’t the longest, or most scenic, it gave us a truly unique experience compared to the single-track we run in the Northwest. Plus, Jesus! The spiders had spikes on them. After our trek, we were looking for something more restful so we made a b-line for the beach. After resting, splashing a little water and flying a drone in Kalihiwai, we packed up. Dinner was at a just so-so pizza place in Koloa, Pizzetta. We were short on time and were starving. In retrospect it was fine, but we probably could have spent our money better by just stopping for another poke bowl at the supermarket. $20 dinner is better than a $60 dinner. Oh well. Sunday morning we rinse-and-repeated our coffee adventures: Java Kai to the rescue! Once awake and alive, we drove to the Awaawapuhi Trail on the northwest end of the island. The 6.7-mile trail was special in that it ended with a grand view looking out over the Nā Pali Coast. Everyone raved about that location, but landslides had closed access to the coast for months so our view from Awaawapuhi was the closest we were going to come to experiencing the trek this time. At the end of the run Emily was brave enough to venture out onto the exposed, slick clay ridge overlooking the coast. I got a case of the ‘nopes’ and instead stayed back and snapped photos. The run back to our car was uneventful. The grade was kind. The other hikers were friendly. The trip ended with a shower at a Lihue YMCA. Cost: $20 for two passes. Worth. Every Penny. We had a luxurious trip to Hawaii. At no point did we truly skimp. When we wanted beer, we bought it. When we wanted ice cream, we dined. The areas we saved money on were 1)free airfare, 2)sleeping in a rented van vs. hotel, 3)trading a few sit-down meals for take-out from deli counters and 4)having an activity, running, that was entirely free. The total per-person cost for Emily and me on this four-day trip was $250.